Name referring to its beautiful flowers. Costus speciosus var. angustifolius Ker Gawl. Costus speciosus var. glaber K.Schum. Costus speciosus var. hirsutus (Blume) K.Schum. Costus speciosus var. sericeus (Blume) K.Schum. Costus spicatus var. pubescens Griseb. Herb with one row of spirally arranged leaves along a spirally growing stem. The flowers form on red 10 cm cone-shaped bracts, with several 2 in (5 cm) pure white crinkled flowers protruding from each cone. 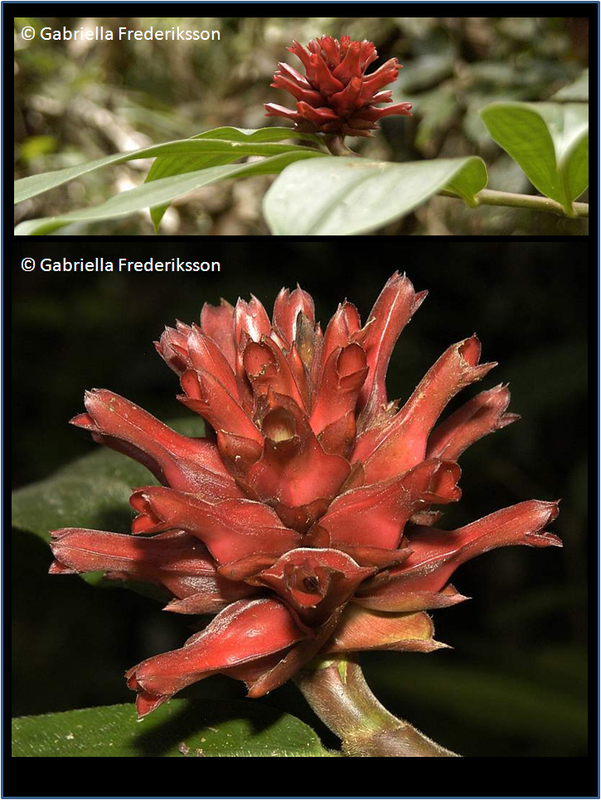 The flowers look like crepe paper - thus the common name of crepe ginger. After the flowers fade away, the attractive red cone-shaped bracts remain. Growing on roadside ditches and low lying areas in the forest understorey, up to 1400 m elevation. Often reproducing vegetatively via underground rhizomes. Seeds dispersed by birds. Medicinal (India) and ornamental (most other parts of the world). The plant has many historical uses in Ayurveda, where the rhizome has been used to treat fever, rash, asthma, bronchitis, and intestinal worms. It is mentioned in the Kama Sutra as an ingredient in a cosmetic to be used on the eyelashes to increase sexual attractiveness. Pan-tropical, but originally from SE Asia and Peninsular Malaysia to New Guinea and western Pacific. Crape ginger (English), Isebsab (Palauan), Jom Lakhuti (Assamese), Keu or Kemuk or Keumul (Bengali), Keukand (Hindi), kostam (Tamil), Malay ginger (English), Pakarmula (Gujarati), Pushkarmula (Marathi and Sanskrit), Thebu (Sinhala).